The DEC has ordered a cease-and-desist letter to remove water-damaged cars from the habitat of the endangered tiger salamander and short-eared owl in Calverton. The New York State Department of Environmental Conservation has served a cease and desist letter to Burman and Copart, the company that is storing hundreds of vehicles that were damaged by water from Hurricane Sandy on a piece of protected land in Calverton. The Calverton Enterprise Park is a plot of grassland that is owned by Burman’s company and also happens to be the habitat of two species that are listed as threatened or endangered by the state – the eastern tiger salamander and the short-eared owl. The cars and trucks are currently located within 1,000 feet of a documented tiger salamander breeding pond, and short-eared owls will be returning to the area to forage during the winter. “Failure to comply with these directives may result in the initiation of an enforcement action against the property owner and/or lessee," wrote Robert Marsh, Natural Resources Regional Supervisor for the DEC. The current legislation for using land inhabited by threatened or endangered species prohibits species being taken or killed either purposely or accidentally, as well as the “disturbing, harrying, or worrying” the species, according to the DEC, which they see is likely to happen with the numerous vehicles being transported. The Manorville Fire Department has also expressed concern over the location of the water-damaged cars in the grassy plot of land, especially because they were not notified of the operation before it began. Having so many vehicles in the grassy area is considered a fire risk, as a fire can start when salt water corrodes wires and if vehicle batteries are still connected. 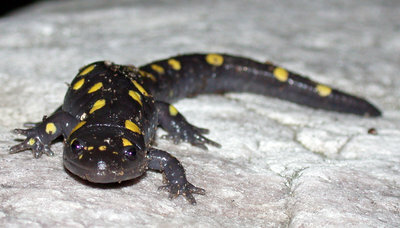 The eastern tiger salamander is one of the largest land-dwelling salamanders in the country, typically measuring between seven and eight inches. It was added to the endangered species list due to a loss of habitat due to development. Only 90 breeding ponds are believed to be in existence in New York, all of which are found on Long Island. Short-eared owls make their habitats in grasslands and marshlands, preferring wide-open areas. They are migratory birds that only come to New York in the winter, though their habitat has also been encroached upon by development. Subject: LongIsland.com - Your Name sent you Article details of "DEC Orders Sandy-Damaged Vehicles to be Removed from Habitat"